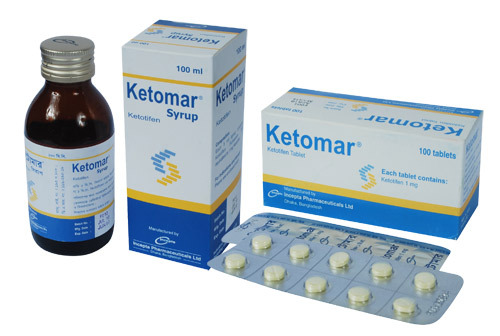 Ketomar Tablet: Each tablet contains Ketotifen Fumarate BP 1.38 mg equivalent to Ketotifen 1 mg.
Ketomar Syrup: Each 5 ml syrup contains Ketotifen Fumarate BP 1.38 mg equivalent to Ketotifen 1 mg.
Ketotifen is a nonbronchodilator anti-asthmatic drug which inhibits the effects of certain endogenous substances known to be inflammatory mediators. In addition, Ketotifen is a potent anti-allergic substance possessing a powerful and sustained noncompetitive histamine (H1) receptor blocking property. Ketotifen is a type of asthma medication which, when taken every day and used along with other anti-asthmatic medications, may reduce the frequency, severity and duration of asthma symptoms or attacks in patients. It may also lead to a reduction in daily requirements of other anti-asthmatic medications such as Theophyllines and b2-agonists, without the deterioration in pulmonary functions (FEV1, FVC and PEFR). 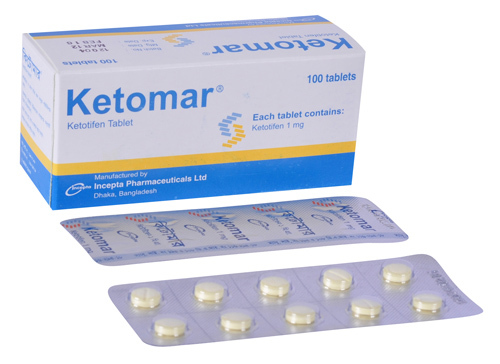 The prophylactic activity of Ketotifen may take several weeks to become fully established. Ketotifen will not abort established attacks of asthma. - Allergic conditions such as hay fever, itchy rash or reactions to insect bites. 1 mg twice daily (once in the morning & once in the evening. Elderly Same as adult dose or as advised by the physician. 0.25 ml / kg body weight, twice daily (Once in the morning & once in the evening). * Missed dose- If a dose of this medicine is missed that should be taken as soon as possible. However, if it is almost time for the next dose, skip the missed dose and the regular dosing schedule should be maintained. Dose should not be doubled in case of a missed dose. Drowsiness, and in isolated cases dry mouth and slight dizziness may occur at the beginning of treatment but usually disappear spontaneously after a few days. Symptomatic and prophylactic anti-asthmatic drugs (Xanthine derivatives, b2-agonists, Sodium Cromoglycate, Corticosteroids) already in use should not be reduced immediately when treatment with Ketotifen is initiated. This applies especially to Systemic Corticosteroids and ACTH injections because of the possible existence of adrenocortical insufficiency in steroid-dependent patients. During the first day of treatment with Ketotifen, reactions may be impaired and patients should be warned not to take charge of vehicle or machinery until the effect of Ketotifen treatment on the individual is known. Pregnancy: Its safety in human pregnancy has not been established. Ketotifen should therefore be given to pregnant women only in compelling circumstances. Lactation: Ketotifen is excreted in breast milk. Therefore mothers receiving Ketotifen should not breast-feed.